Everywhere we turn in the old part of town we see coats of arms -- some are big, some are small, some are colorful and others are plain stone. They are over entrances to many Palazzi in the city and can be found on public buildings, as well. Simply put, they are everywhere and we wanted to know more about them. So, we've started a new series of posts on the costs of arms of Florence. We're calling it araldica di firenze. Each Tuesday and Thursday for the next few weeks we will post a new coat of arms. 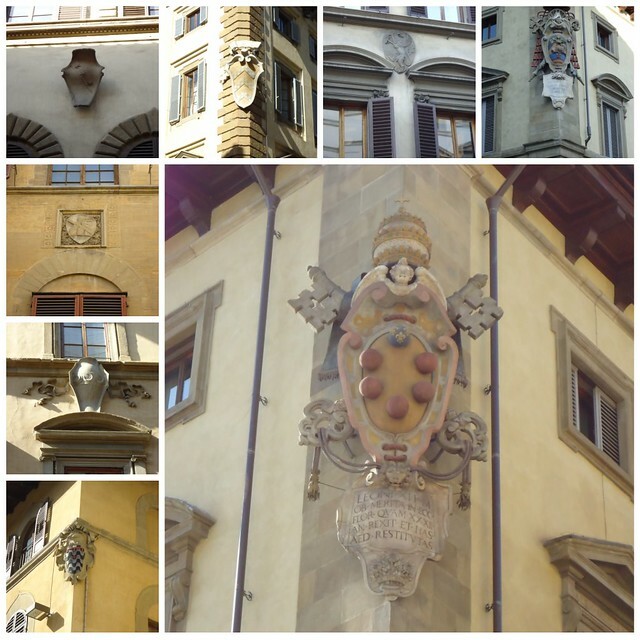 We'll do our best to identify the family or person who used (and sometimes still does use) these arms, give a bit of history about the family and then tell you where you can find them when you next visit Firenze. Look for the first post tomorrow! A quick disclaimer to any and all heraldry experts out there (we're sure the internet is teeming with them): We use terms as best we can when we describe the arms, so if you have a better way of describing what you're seeing, send us an email or leave a comment.